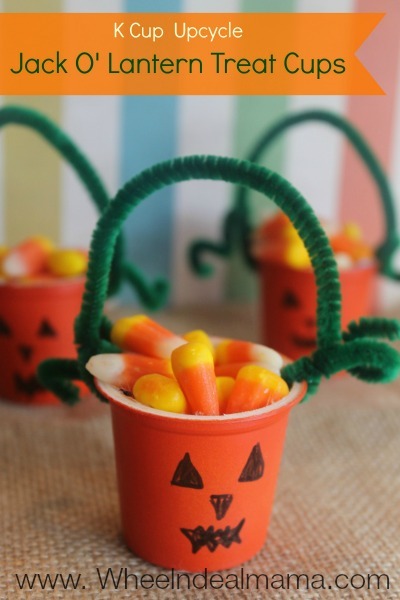 These fun treat cups are not only a great way to up cycle your discarded K-cups but they are a perfect sized treat to hand out to trick or treaters, your childs classmates, or to family and neighbors. It is easy enough that the children can take part in creating it- how fun are handmade gifts? Drop in a battery operated tea light from the dollar store and line them up in your windows, down a walkway, hang the handles from string and make a Halloween swag, or hand individual ones from trees all over the yard. If you don’t use k cups a quick call out to friends and family on Facebook to save their leftovers will surely result in a surplus of supplies for you! Be sure to follow me on Pinterest for more fun crafts! Peel top off k-cups and discard, dump out grounds or add them to your compost. 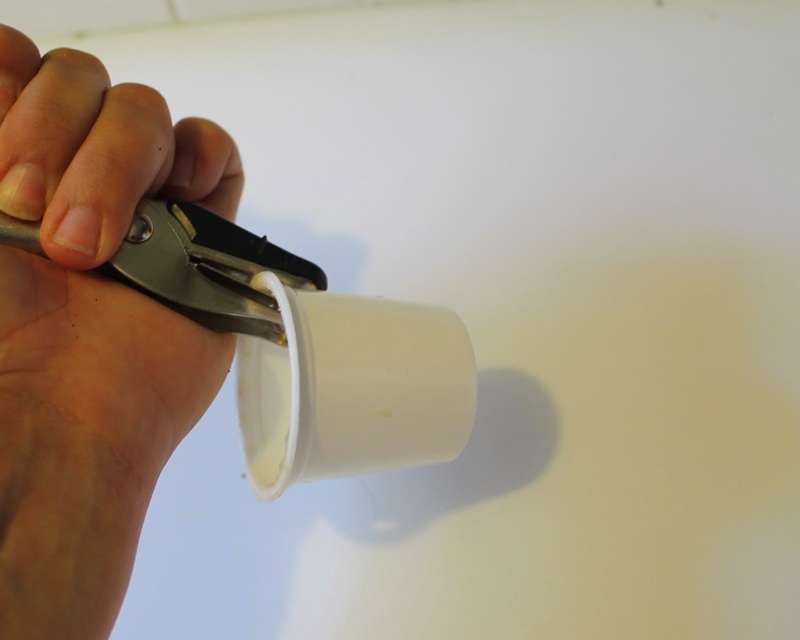 Wash and dry cups completely. Slide a hole punch over the open end and make holes on each side of the cup directly across from each other, this is where your handle will go. 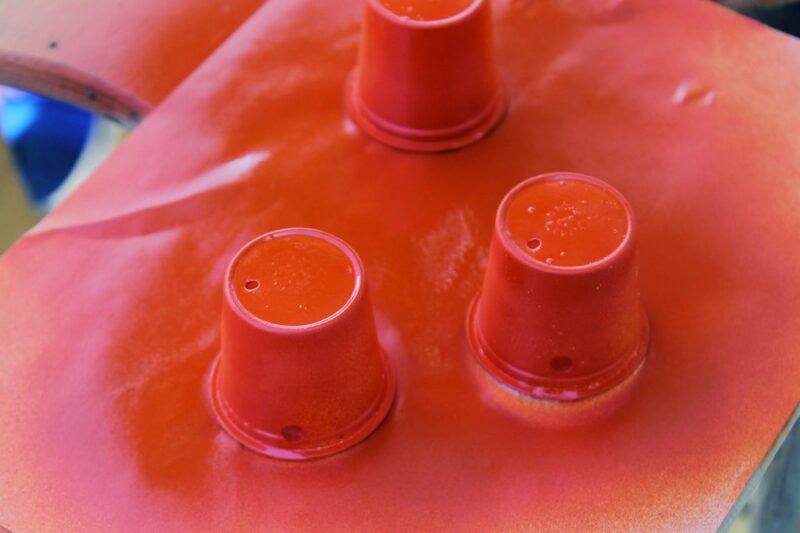 Take cups outside and spread out on paper, spray with one light even coat. Dry for 5 minutes, and spray with 1-2 additional coats to cover well. Dry final coat for 2 hours minimum. Draw on facial features with black sharpie, dry for 10 minutes to avoid smudges. Run chenille stem through hole on one side and out the other, centering it equally. Pull up on center of chenille stem to form a handle, leaving about 3″ sticking out each side. Wrap ends up the handle a couple times then twist the end around a pencil to create a twining vine. Fill your basket with popcorn, candy corn, carrot sticks, mms, or any other small treat that fits.